Many in the silencer industry will tell you that there is only so much you can do with a baffle stack inside of a metal tube. They will say that innovation in the industry is at a stalemate, that there is nothing new to bring to market. They are wrong. 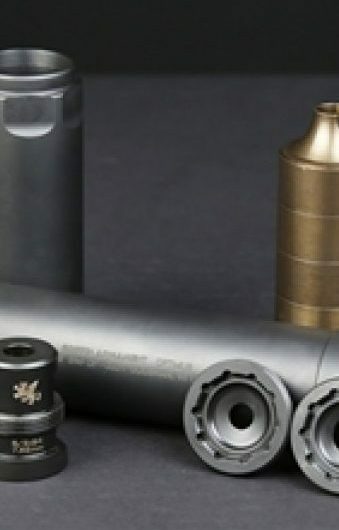 Griffin Armament has created a tradition for itself in recent years by being first-to-market with revolutionary concepts packed into quality products at a great value. The Optimus is the culmination of their efforts to date (though we are still expecting great things out of this company!). It is also compatible with the following Griffin Mounting solutions. Sold separately. By changing out mounting hardware and endcaps, the Optimus can be configured to shoot many different calibers on a wide variety of hosts. It is rated (in full size configuration) to .300 WinMag and will work on any lesser rifle round. Drop a 3-lug coupler or Revolution Fixed Barrel Adapter onto it in the short configuration and you can still run it on 5.56 or .300 BLK (these calibers obviously also work in the full size as well). Drop the booster system into it and you are ready to rock on any 9mm semi-auto handgun. Since it is also user-serviceable, you can run it on rimfire hosts as well! Direct thread, Taper Mount or 3-lug; the Optimus will work in either large or small configurations on any rimfire caliber host platform.